Vietnam’s ancient and modern histories converge gloriously in the month of April, and visitors can enjoy the entire nation in its celebrations. An annual festival is held over three days, from April 13 to 15, at the Hung King Temple on Nghia Linh Mountain in Phu Tho, a northern province that neighbors Hanoi. 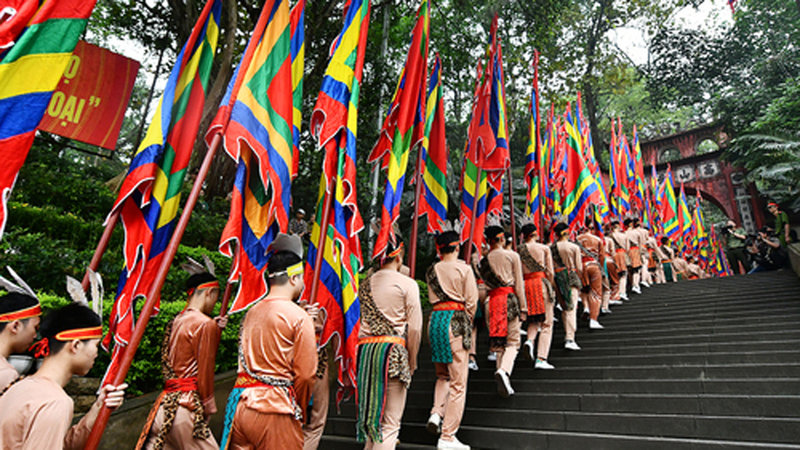 The festival honors the legendary founders of the Vietnamese nation. An annual festival is held over three days, from April 13 to 15, at the Hung King Temple on Nghia Linh Mountain in Phu Tho. It’s an occasion for Vietnamese to remember their distinct origins and show their respect to their ancestors. The festival is a gala affair of folk games, bamboo swings, rice cooking contests, lion dances, human chess, water puppetry, wrestling and crossbow shooting. Those particularly interested in folk music can enjoy xoan and gheo singing. These are different forms of traditional Vietnamese folk opera recognized by UNESCO as an Intangible Cultural Heritage of Humanity. Book accommodation early in Phu Tho, because it gets very crowded during the festival days. Visitors can get to Viet Tri town in Phu Tho by train from Hanoi, then take a bus to the Hung King Temple. 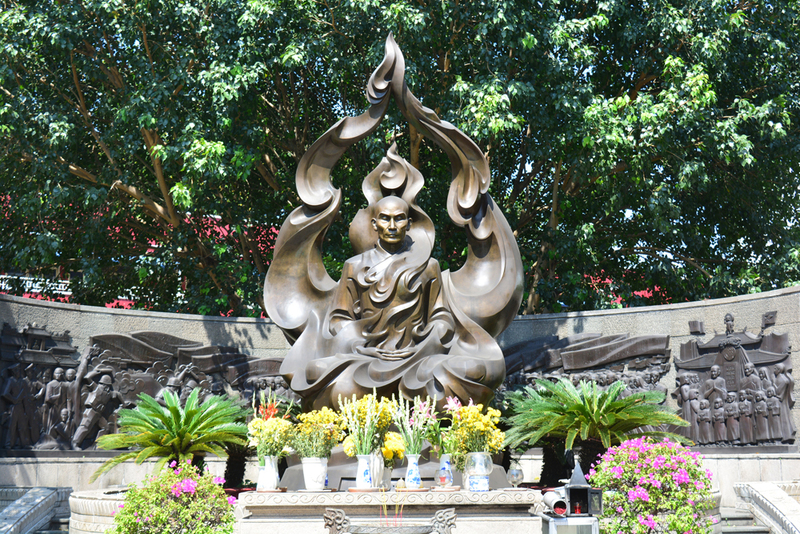 Statue of Thich Quang Duc, also known as The Monk on Fire, in a public square of Ho Chi Minh City. This is where the Vietnam War 44 years ago, on April 30, ended in scenes that have been seared in memory via photographs, be it the helicopter departing from a rooftop or the tanks bursting through the gates of the Independence Palace. The tank is still on the premises, and you can see it to this day. April 30 is a national holiday and is celebrated as National Reunification Day. It is a great time to be in HCMC, with national flags displayed in every building, and many activities held to celebrate the historic day. Apart from the War Remnants Museum that records the brutal history of the Vietnam War, other related monuments are worth visiting. The most powerful monument of them all is a memorial to “the burning monk,” built exactly where the incredible self-immolation happened. Malcome Browne’s photograph of the event shocked the world and awakened it to the US-installed regime ruling in the south of Vietnam. Imperial Royal Palace of Nguyen Dynasty (1802-1945) in Hue. The former capital Hue is famous for its citadels and UNESCO sites, and its delicious and unique local cuisine. Its particular charm lies in the fact that despite being one of the most photogenic cities in Vietnam, contemporary Hue carries itself with modesty. The warm and quiet provincial vibe is still there although tourism has bloomed here for decades. Hue is a great place for long walks as well as bicycle rides. 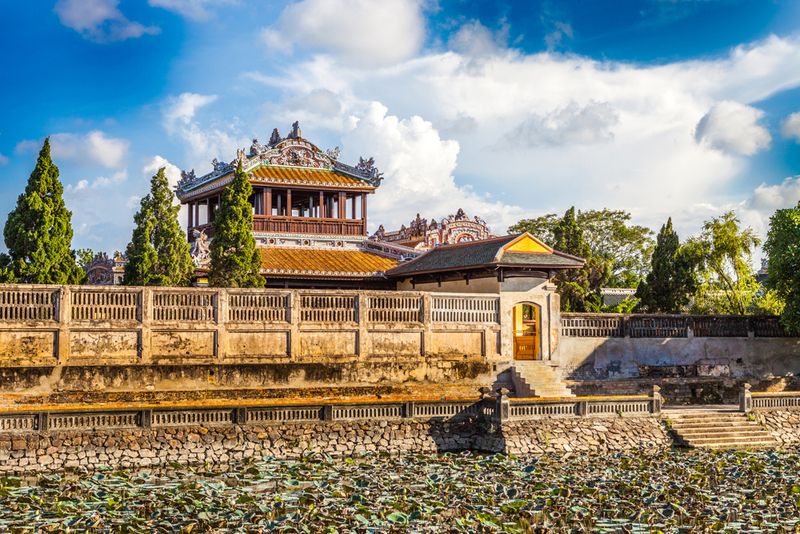 The must-go places here include the famous citadel and tombs of the Nguyen Emperors, the Hue High School for the Gifted – the second oldest high school in Vietnam and the Thien Mu Pagoda. The Thien Mu Pagoda acquires added importance in April. It preserves the car that carried Thich Quang Duc, the Buddhist monk who famously immolated himself to protest the persecution of Buddhists by the US-installed regime of Ngo Dinh Diem in South Vietnam. Hoi An ancient town in the afternoon. 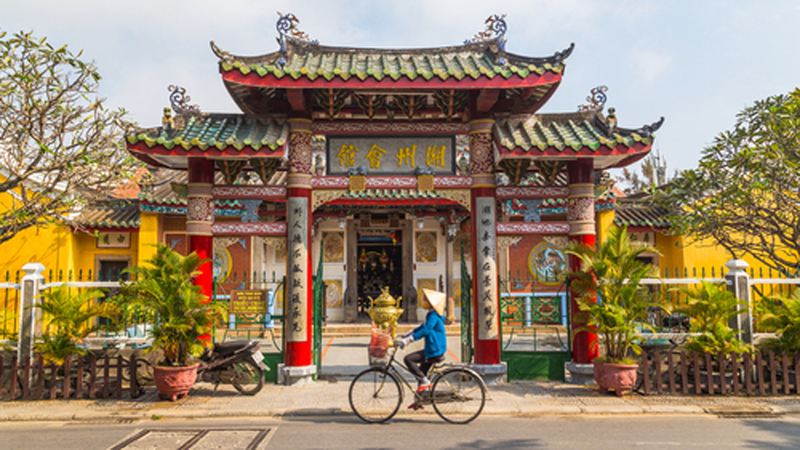 The authentic old world feel of Hoi An is something that draws visitors to return to this town again and again. One can never tire of this vibe, as well as the added attractions of its colourful lanterns and distinct cuisine. Strolling in Hoi An at sunset is a fantastic way to end the day. The town is quiet in the evening, and there are night markets and boat rides. Hoi An has banned motorbikes on some of its roads at night, so a walking friendly ambience is guaranteed. Hoi An specialties like caolau (dry pork mixed noodles), chicken rice or banh mi Hoi An (sandwich) will tickle your palate. Cooking classes here are also very popular. A half or full day course costs $30-60. Peaceful beach with white sand in Nha Trang. 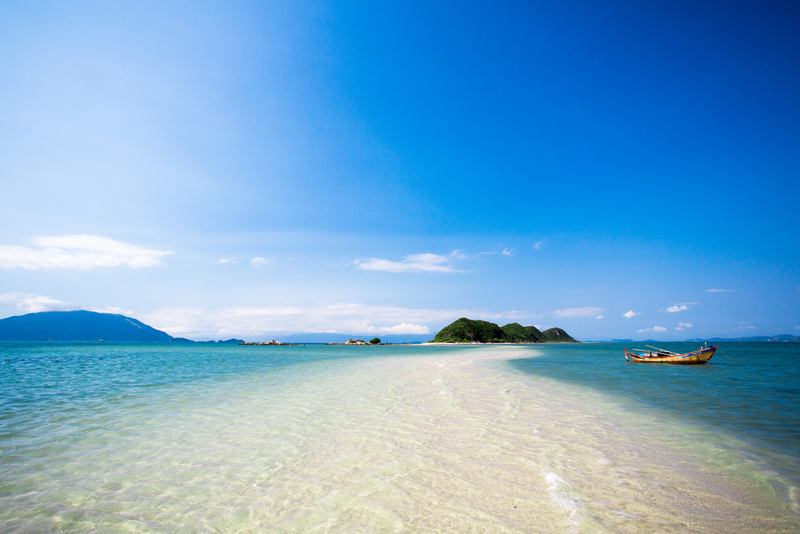 There is a reason that Nha Trang is one of Vietnam’s most popular beach destinations. It has wonderful beaches that stretch into a great backdrop of mountains. The beaches to the north and south of the town are home to many outstanding resorts, with some luxurious facilities in Ninh Van Bay particularly worth trying out. For some history boost, Po Nagar temple tower is an ideal spot to visit. It’s dedicated to Yan Po Nagar, the goddess of the country. Po Nagar is situated on Cu Lao Mountain of Nha Trang. Nha Trang is also known for making one of the best fish sauces in Vietnam, giving dishes here an extra flavor. US News has added Ha Long Bay to its list of world’s 30 most famous landmarks to visit at least once in a lifetime.